Thank you cuppy for a marvellous challenge. 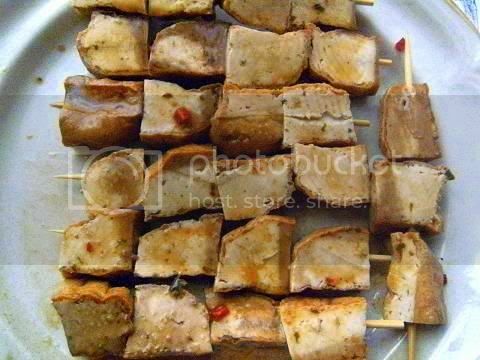 This month's challenge is all about marinating and making satay – we where allowed to use any meat or vegan option we wanted so I thought I would do three meats and tofu (I love tofu). 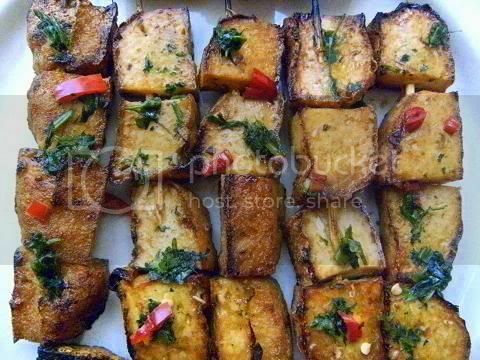 The marinating recipe was a very good base (except for the use of cumin which I found very strange which I omitted) I added a lot of mint, chillies, coriander, kacup manis, tamarind and fish sauce to the marinade it was delightful. To the peanut sauce I again added mint, chillies, coriander, kacup manis, palm sugar and fish sauce just to give it some extra punch. I think that the recipes given are more Thai-inspired than true Thai but they would be great for naïve tasters and would be a gentle introduction to this flavoursome cuisine. 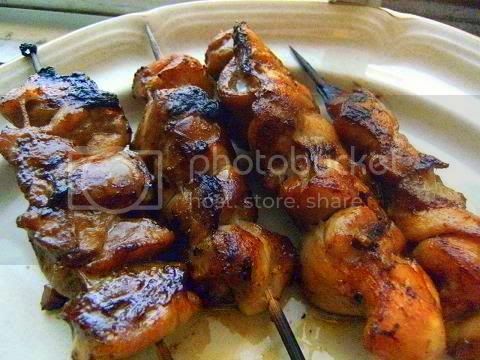 What a fabulous and super-quick recipe I did chicken thighs satay 18 hour-marinade I did the marinade I couldn't bring myself to put in cumin so I replaced it with more ginger, lemongrass, chillies, katcup manis, fish sauce and palm sugar. It was fabulous. Then I grilled (broiled) them in the oven-griller I found out my BBQ is broken!!! Then to the peanut satay I used the recipe but used a handful of chopped coriander and mint, 1 tbsp palm sugar and one red chilli again I couldn't bring myself to use cumin so I added some ginger, lemongrass, coriander, hot chillies, 1 tbsp lime juice and 3 Tbsp of sweet chilli sauce to the satay, it was so so delicious and exactly the way I like. Kangaroo BBQed tastes very much like a mouthwatering version of rare roast beef (most people cannot tell the difference) I make spaghetti bolognese and roo meatballs often and always get rave reviews about it, in my 'spag bol' I always add some grated roasted beetroot which really adds a depth of flavour and colour that is very appealing to the sauce. Kangaroo cooks in no time at all (great for BBQs) it is very low in fat and high in nutritents so is a 'healthy' meat and is much cheaper than beef. The kangaroo was absolutely delicious I will be making this again and again. The key to a great marinade is to have an acid (lemon, lime, brine, soy, vinegar, etc) and an oil (peanut, vegetable, corn, olive, etc). If you’re already working with a soft meat (filet mignon) or vegetable (capsicum) or tofu, then you can skip the oil entirely. Potatoes and tofu still need to be marinated for flavour, otherwise you may as well dip French fries in catsup. If you're going to grill, I suggest you include the oil anyway. I'm the first to comment!! ;=) It's still 10 am wednesday the 13th here. I'm doing my version today. 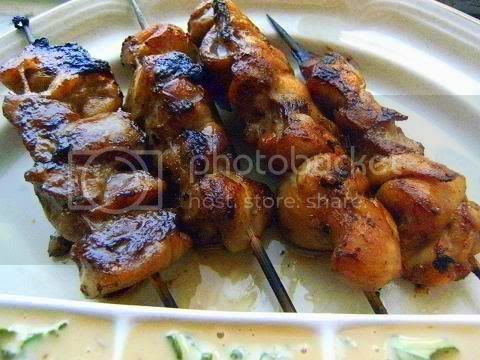 Your satay looks delicious. I wonder how the kangaroo meat would taste like, is there any meat you can compare it w/? Thank for your comment TaGa Luto. Kangaroo BBQed tastes very much like a mouthwatering version of rare roast beef (most people cannot tell the difference) I make spaghetti bolognese and roo meatballs often and always get rave reviews about them, in my 'spag bol' I always add some grated roasted beetroot which really adds a depth of flavour and colour that is very appealing to the sauce. Kangaroo cooks in no time at all (great for BBQs) it is very low in fat and high in nutritents so is a 'healthy' meat and is much cheaper than beef. Hi Audax, great satays and everything looks delicious. I had kangaroo meat a long time ago and I must say it was pretty tasty. Oh audax!.. you create such yummy delights every time!!! :))) such an inspiration! "I think that the recipes given are more Thai-inspired than true Thai but they would be great for naïve tasters and would be a gentle introduction to this flavoursome cuisine. " You are absolutely fabulous, and your satay looks wonderful. Seeing your post uplifts my spirits on this challenge. I wanted to leave very little room for people to avoid the recipe, and seeing your post reaffirms my confidence in the decision to pick satay. When it comes to "cook it on a stick", the possibilities truly are endless, and I love that you thought out of the box and changed the recipes. Thank you!!!!! I had not thought of kangaroo - but I definitely want to give that a go now! 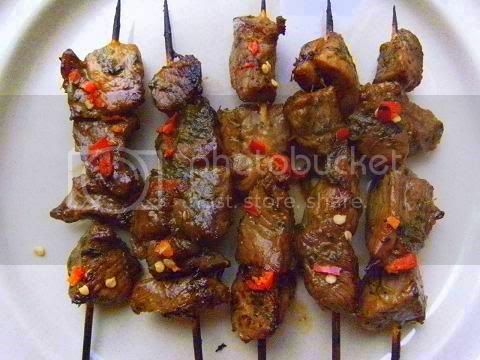 The kangaroo satay looks especially delicious! Makes me wish I'd tried beef. Great job! Fantastic. Love the idea of kangaroo! I liked the mix with the spices as is.. wasn't exactly standard thai but went down very well with my less spice loving family members and the peanut sauce was really good you should try it.. It's different but still good. Thanks for your comment. I like the kangaroo, it's not a meat that I'm fond of, but I may give it another go satayed. Wonderful array of satay varieties! I did the pork only and I've definitely got to try some other meat. Well done! Your satays look amazing - very impressed with how many you made as well! 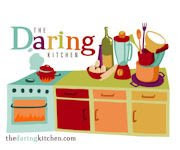 Good to see you are spreading the word on kangaroo meat - we cook with it at home quite a bit and its great, good flavour, inexpensive, keeps a while and lower in fat than other red meat! Interesting to see you modified the marinade - we also used a different recipe for the challenge, based on a recipe from the wonderful Thai restaurant, Spirit House! Love your additions to the marinade, especially the mint. Excellent work on all the different versions. 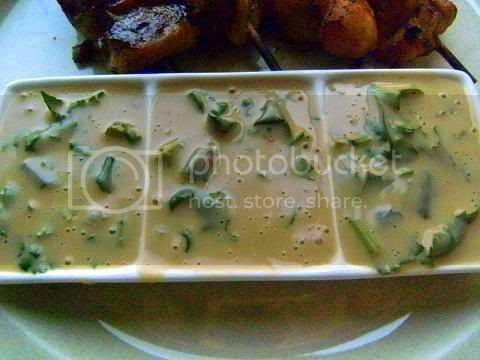 I am not a fan of tofu and you actually managed to make it look appetizing. After seeing the kangaroo photos, I am convinced that I would eat it all the time if I lived on your side of the Earth. as always it is all delicious looking and wow did you answer this challenge. I think there must be a stick shortage in Australia now that you had a go at them. Audax, you have the most variety of satays. Excellent! Never tried kangaroo meat, but definitely would whenever the opportunity knocks.... for that reason maybe I should go to australia?? Good on you for making so many different types of satay. Good job! Hi Audax... thanks for your comment and visiting my blog. I am very intrigued by the kangaroo...quite certain I won't find that here in upstate NY, though :) Our version is the ubiquitous deer, I guess! OH.MY,GOD..is there ever a time when you don't rock a challenge? I think not! What a gorgeous array of satay perfection, and the kangaroo is definitely the most original take on this challenge! Amazing job as always, Aud! Interesting. It never occurred to me that people would eat kangaroos. Then again, I doubt I've ever seen one in real life so there's the answer to that mystery =D. You've done an amazing job Audax. You always raise the bar and make me much more excited to see what can be done with the recipe provided! You are amazing! I might have to write a poem about you (and the kangaroo) haha. I love your photos - really beautiful. Wow, your variety and creativity never ceases to amaze me. I'm so impressed! 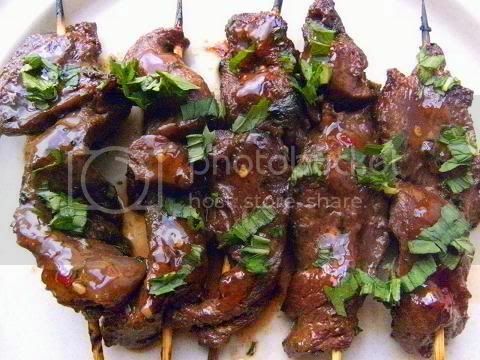 I'd love to try the kangaroo satay, it looks delicious! Audax - Wonderful, comprehensive post, with amazing flavor combinations, as usual! Kangaroo sounds interesting, as does the veal. Cheers to you! I always look forward to seeing what you've whipped up, audax! all the different kinds of satay you made look great. And crazy how you use kangaroo meat! wow, i wonder how that taste like...! Audax, your satay kangaroo completely blew my mind off. I have never thought about eating kangaroo and now I'll have to find out where to try one (aside from going to Australia). Fantastic photos and variety! Great job - everything looks sooo delish... Kangaroo - I would like to try that! 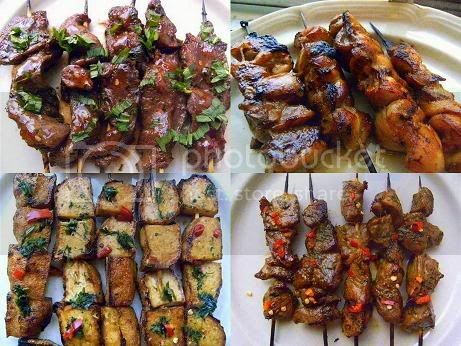 What a great variety of satay! I have never tried kangaroo (for some reason we don't get that here in Sweden - strange! LOL :)) but I would love to try it! Wonderful job as always Audax! Ah... you wouldn't be you if you didn't at least make several versions of this! It looks wonderful Audax all those different satay versions!! Love it! Your satays all look delicious. Your interesting assortment has now tempted me to try some other variations that I might not have thought of. Now I know what to do with the moose meat my neighbour gave me:) I actually bought some extra firm tofu today just to try, and after seeing your I can hardly wait. Thanks for an entertaining and informative post! Kangaroo! That is exotic! Wonderful satays! I have got to try the Kangaroo!!! Looks Yummy! I love your embellishments to the marinades and sauces. You're obviously past the "gentle introduction" phase. Every version of your satay looks as good as the next. Thanks for the lesson in RooQ. I ate kangaroo a few times like a steak and I really liked the flavour. But I love that you made them into satays! I am trying this for sure! Wow! They all look so tender and juicy esp the kangaroo!well done! Lemongrass should be a nice addition. Wow, your selections look great! I would be quite keen to try the tofu too, maybe next time. First time I heard that you could eat kangaroo meat (although if I say it out loud it sounds kinda obvious now). 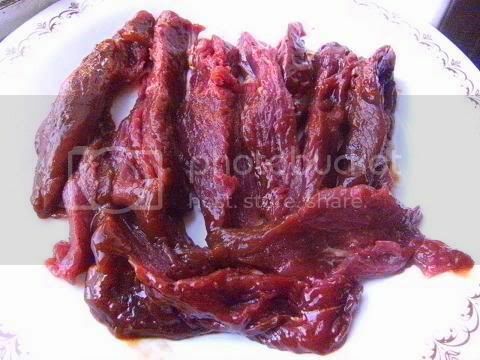 It sounds very similar to our ostrich meat in South Africa - also very lowfat and similar in taste to beef. Will definitely put 'roo meat on my to-taste list if one day I'm in Australia. You are just fantastic! Your satay looks so good! I couldn't make myself prepare it - just hate the idea:) I'm still thinking about vegetable satay, but it's a bit late. I'm speechless! What a lovely variety of Satay! they all look so delicious including the sauce! Great presentation too. Next time I will try beef Satay. We can always trust you to rock the challenge! I love all your variations. A satay fiesta !! Great ! :) Kangaroo meat is quite hard to find in Canada but I had it once or twice and loved it. I love the idea to make satays with it ! Amazing job! Kudos for the creativity with the kangaroo (that's one I haven't tried -- but I'd definitely be game!) Lovely presentation too! Thanks for recommending the addition of cilantro and mint - truly transformed the dish! Haha, only in Australia would kangaroo have been an option! As always, you have surprised us, and you have done an amazing job on this challenge! Your meat is so beautifully cooked! All of your satays look wonderful, but what I really think is the most beautiful pic is that peanut sauce! Great work! I'm going to have to try these recipes for sure. You're amazing. Kangoroo? Wow! Now i'm dying to taste it. Great job, as always. I love how it looks on the skewers... will definitely have to do the recipe again and try it that way. Maybe with veggies, mmm. I would love to try kangaroo. Everything looks really good. I can't believe I used to hate satay when I was younger. Your peanut sauce sounds mouthwatering, even though I like cumin, as does the kangaroo. Thanks for commenting! Audax - always a pleasure to read about your delicious creations! Kangaroo sounds interesting - we did not try it on our one and only visit to Australia but will make a point of doing so next time. Wow great variety as always, the satay look delicious. Thank you for such a nice comment on my post!!! I'm touched. Wow, kangaroo? Have never tried it. You always go all out!!! Hi Audax, thanks for the lovely comment. Your post is terrific, the tofu looks especially yummy. My honey Dave Pataky has been helping me with the pics. I'll pass on the compliment! all your pics are great! It all looks mouth watering and appetizing. Glad to see you with us. Hope all is well on the Australian front. Audax thanks for leaving a comment on my blog. I really like the idea of kangaroo, I have never tried that. I wonder if I could get it in California! Thanks again, and your Satay's look delicious. Hi Audax! Thank you for stopping by my blog...I'm looking at your pictures vs mine, and there is just no comparison. Our pork satay was delicious, and very moist and juicy, but the pictures certainly don't show that. I was feeding our HUNGRY family, so didn't have time to do much with 'food styling', but the way food looks makes such a difference to the way it appeals esp. on blogs! I really enjoy your blog, and the fantastic food! Love your pics and all the variety. The one time I had Kangaroo, it was tough (a student cooked it), so I'm looking forward to trying it this way with a marinade, etc.. Thanx, also for your comments - they keep me inspired! You're always impressive. Wow - what a fantastic assortment of satays - kangaroo just never dawned on me. I have looked at your blog before but never commented (always a little intimidated by your amazing skills) - thanks for stopping by my blog. It is nice to have someone in the neighbourhood. All of your versions look great. Kangaroo! I am very curious about that. Oh wow! You had a blast with this challenge! Mint is a good addition to the sauce, I'll try this next time! And lemongrass, that must have been fabulous! Great photos! thanks for leaving such a nice comment :-) I felt ashamed when seeing all your satays, wow!! Hey Audax, thanks for stopoing by my blog. I was in your neck of the woods for the holidays -- on the Great Ocean Road, in Melbourne, and in Sydney a few days. What a lovely country you have! (And have to say it's rather delicious - have tried kangaroo here in Spain at one restaurant, but I couldn't get over how cheap it was in Oz when we were there. Even managed to convince my foodafobic Ozzie relatives to try it!).. Audax, thanks for your comment on my blog, and the advice about the blog checking line - I really had no idea what you were on about till I checked out your blog! So thanks for helping out a first-timer! Thanks for making me feel better about my late post! Your satays all look delicious and I love all the additions you made, especially the fresh herbs. Great satays, Audax! Up to your usual tricks, I see! Good on you! I have something on my blog for you. I forgot to tell you that this kind of food is called "pinchos" in my country.